The Islamic Corporation for the Insurance of Investment and Export Credit (ICIEC) and the Korea Trade Insurance Corporation (K-sure) have signed a reinsurance agreement to expand business opportunities between the two institutions. Under the agreement, ICIEC will reinsure commercial and political risks related to medium and long-term export credit transactions that involve Korean exporters and contractors selling capital goods and services to ICIEC member countries. ICIEC will also extend reinsurance support to K-sure for Korean investors investing in ICIEC member countries. 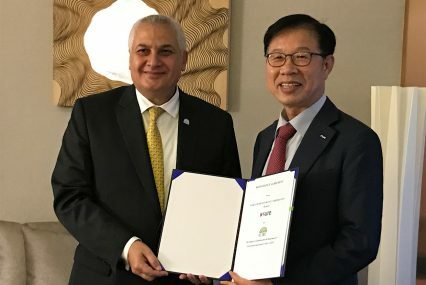 The agreement was signed by Oussama Kaissi, ICIEC CEO and Kim Youg-hak, chairman and president of K-sure (pictured). ICIEC has previously signed similar agreements with other ECAs, including Russia’s Exiar and Italy’s Sace.